For many people, drinking their morning coffee is a ritual needed to kick start the day. Coffee was popularized across Europe in the 17th century, which quickly launched Brazil into becoming the worlds largest bean producer . Today, the average US citizen consumes 7.5lb of beans annually . Recently, coffee has experienced a craft revolution that has popularized micro-roasteries, local coffee shops, espresso drinks, and unique brewing equipment . This trend has manifested a very interesting and recognizable aesthetic that although difficult to describe, can be easily understood by looking at some images of how coffee is portrayed in images. Naturally, I first turned to a google image search of the word “latte”. This yielded the classic image of a large cup, framed closely, sitting on hard wood, and topped with an intricate heart or leaf design. This image is a great example of how coffee is portrayed in commercials and on social media, which provoke our associations of being comfortable, relaxed, invited, and warm. These associations are strengthened by the accompanied atmosphere of a local coffee shop. In addition to actually getting coffee, consumers go to a coffee shop for the experience, community, ambiance, and sometimes for a productive place to get some work done. 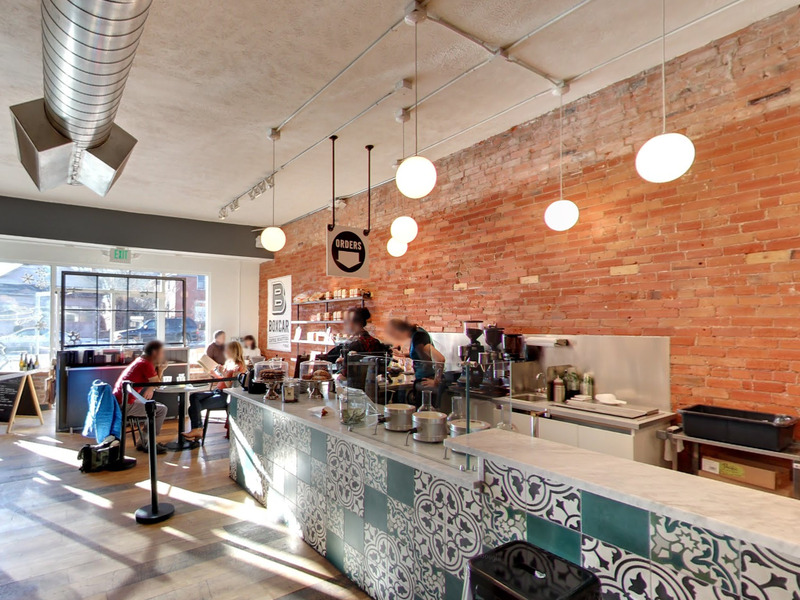 The interior design and decor of a coffee shop tends to combine elements of industrial and modern, often having exposed brick, hard wood floors, casual lighting, and shiny stainless espresso machines. This aesthetic seems to be aimed at a young, educated, and affluent demographic. I think that one could argue that there is a large overlap with the intellectual and hipster aesthetic. Even businesses like Starbucks (quality aside), which is aiming for a much broader demographic, is emulating the aesthetic that is more genuinely created by a local place. The above image shows a bar-like counter, which is inviting and community oriented. We typically think of fast establishments like this as being grungy and worn-out (think Dunkin Donuts or McDonalds), however, Starbuck locations are always well maintained, have a similar modern/faux-industrial vibe. The aesthetic of coffee is also apparent in the fusion of simple and functional design shared by popular brewing equipment. The style heavy utilizes glass, stainless steel, and a variety of solid bold colors. There is a certain minimalist look that incorporates organic shapes and modern lines. This design style shares many similarities with Scandanavian design. Although the above Chemex pour over primarily functions as a coffee maker, is also a piece of artwork in its own right. The body is made from a single piece of borosilicate glass, with an integrated spout. The paper filters unnecessarily extend up in a pleasing arch that almost give the process a science experiment-like feel. The center is wrapped in a beautiful conformal wood koozie, and tied together with a leather lace and matching wood bead. The french press also has a glass body, and incorporates a simple folded stainless sheet metal housing. This housing connects the handle and gives the glass structure feet. The french press shares a a certain minimalist modern quality with the Chemex that makes them beautiful, as well as functional. I really like this aesthetic. I have noticed it has grown immensely in the past few years, with coffee shops putting immense amounts of time marketing their “special” coffee. I am always drawn to trying new coffee brands and styles, but for the most part they all taste pretty similar. I recently purchased an espresso maker and it has really made the coffee drinking experience much more fun. It opened my eyes to the types of creative ways people make coffee and caffeinated drinks, and I can see now how the culture has grown so much. I really enjoy the aesthetic of the Boxcar shop on pearl street, that kind of design would definitely draw me into their shop. Excellent post on coffee. You really hit on an aesthetic that is trending across the country. Craft coffee shops are popping up all over the place, and they all seem to have a similar vibe. Nice work calling out specific attributes of this aesthetic. In context of design, there is much more that could be discussed about the modern coffee industry. There is a ton of design going into packaging, travel cups, and coffee machines. What differentiates between all those travel mugs? What constitutes a good pod? What kind of graphics conveys a good blend? Whatever the case may be, coffee is one area where I relish in choice fatigue. The culture and design surrounding coffee is one of my favorite aesthetics. I have noticed the “hipster” coffee movement slowly evolve into a more mainstream appreciation of coffee. Part of this could be attributed to Starbuck’s great success in replicating the aesthetic and create a mainstream appreciation, as you mentioned in your post. I’m interested in how the modern craft coffee movement will evolve outside of Boulder, where we are spoiled with a plethora of amazing local cafes. The video at the end is hilarious and I love it! It clearly portrays the extremes of all the different types of people who go to coffee shops. Boxcar Coffee was one of the shops you included a picture of and it is one of my favorite places in Boulder because of its modern feel, minimalist approach, beautiful cups, and smooth-tasting coffee. I am an avid coffee drinker and one of my passions is exploring different coffee shops. There is definitely a unique aesthetic and feel to each and every shop and this attracts different crowds to each place. I will admit that yes I have spent time watching youtube videos of coffee art 🙂 You should check it out! First off that video is great. It definitely portrays the stereotype of the hipster/craft coffee relationship well. In a lot of ways the movement and aesthetic of craft coffee reminds me a lot of the craft beer movement. Both have a similar mentality to the beverage itself in addition to the community aspect of the locations where it is enjoyed. It will be interesting to see, as the trend of craft coffee continues to grow, if it continues to correlate to craft beer or if it draws the appeal of a different type of demographic.